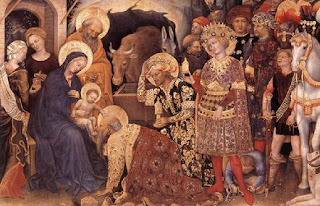 Of the Christmas stories, it is the story of the Magi that most intrigues me. Only Matthew tells their story and then, their mission accomplished, they disappear back into the desert and we hear of them no more in the Scriptures. Are they a literary construction by Matthew to serve the larger purposes of his gospel (presaging Christ’s glory; anticipating the universal great commission at the end of the gospel and its mission to all lands and peoples)? Or, is there an historical thread that holds the story of these Magi, even if we have to endure the silence as to what followed when they returned to their own lands? One way of thinking about the Magi is to compare their story with that of the Shepherds in Luke’s gospel. The shepherds are gifted with the vision of the angel, hear the message and instinctually respond with wonder. You could say they move at the behest of the heart rather than the mind. They are awestruck, overwhelmed and their kneejerk response is to simply go and see. Some of us can live and work that way – our heart responds to need or wonder and we act. That is a great gift. The Magi are, I suggest quite different. Their response is driven by the mind, the reason. They are students of astronomy and astrology; we may imagine them as concerned with charts of the heavens; with detailed observations; with codes, cyphers, symbols and a vast range of esoteric knowledge. For them the journey to Bethlehem has begun long before the revelation to the shepherds. They have observed the appearance of a star; then they have begun to track it; and then speculated as to what it might mean. Then they have actually followed the star – which means all the planning for a long journey and the hazards and difficulties that might well involve. This is all the work of the mind: the adventure of thought; drawing us to see and explore, to test and to wonder. The mind is the way many of us are most accustomed to live and work and our faith may be mind-driven. That is not to say that the heart has no place in our faith but that the life of the mind is incredibly important for questioning faith and thereby growing it. Our thinking explores our faith, and the adventures of thought and faith work together, informing one the other, to remind us that our calling is no mere impulse but a life-long work. This life-long work is at the very heart of Epiphany. The work Epiphany comes from the Greek phainein ‘to bring to light’ – and - while the church has seen in the story of the (non-Jewish) Magi a revelation that God’s saving purpose is to encompass all humanity – the elements of discovery, of insight and our search for understanding are crucial to the word and how we understand it. The Magi model the concept! Of course none of this answers the questions of historical verification for the Magi and maybe this is beyond the reach of history. Yet the rumours and legends abound. More than that, the Magi have become an integral part of how we understand this Christmas story and how we live it. I should be glad of another death,"
At least we know for certain that we are three old sinners. But have only the vaguest idea why we are what we are. And that brings the story of the Magi into our time and moment; that is the gospel calling to discover who we are and how to be human. That’s really and most truly why we are here this morning.